On primary day, when Maine voters decide on ranked-choice voting, they can open the way to sound alternatives to produce majority winners and avoid the risk of more court challenges. Voters will be asked to overturn the Legislature’s decision to suspend ranked-choice voting until 2021 to give the people time to amend the Maine Constitution to allow this form of voting in all elections, not only a few. The issue has arisen because candidates could be elected by getting a plurality of votes, even if it is not a majority. Maine is one of 41 states that use this plurality voting process. The original popular vote in favor of ranked-choice voting was a rejection of plurality elections. Most recent governors have been elected by less than an outright majority. The first election of Gov. Paul LePage, in a three-way race in 2010, seems to have been particularly troubling. For some advocates, ranked-choice voting, though not used statewide elsewhere, seemed to be the only solution. But there is a major problem with ranked-choice voting that is almost certain to push the system back into court. It likely violates the U.S. Supreme Court’s mandate of one person, one vote. Let’s say your first choice vote goes to a candidate who will last until the last round of computer runoffs under ranked-choice voting. But another voter’s first and second choices are both eliminated. In the end, the other voter’s third choice — the third time they have voted and each time for a different candidate — is pitted against the one vote you cast for your surviving candidate. The other voter gets have his or her three votes, even for different candidates, count as if they were first choice votes. That simply seems unfair as well as unconstitutional. Somebody else keeps getting chances to knock off your vote for the candidate who got the most first-choice votes. The concern about perennial pluralities is real. But there may be better solutions than ranked-choice voting. If Maine voters want to consider alternatives to ranked-choice voting, they should vote “no” on Question 1. The most obvious alternative is the runoff election, a second round of voting to pick candidates of elect officials. It is less costly than ranked-choice voting, according to data from the Maine secretary of state’s office. Turnouts may decline for runoffs, but they may be as good in the second round of voting as in the first. For example, in 2015, Lewiston held a runoff for mayor and the turnout remained about as high as in the first round. California voters adopted an election system for legislative and congressional primaries that has all the benefits of ranked-choice voting without the potentially unconstitutional drawbacks. It is called a blanket, or top-two, primary. This is what it would look like in Maine on primary day. All candidates would be on a single primary ballot — Democrats, Republicans, Greens, Libertarians and independents. Candidates’ party designations would be determined by party registration. State party conventions could endorse one or more of the candidates, making such people the official designees. The endorsement process could breathe some life into state conventions. But party members could run even if not endorsed. This blanket primary could encourage more candidates. In the 2016 California Senate primary, 15 candidates received more than 1 percent of the vote. The blanket primary reduces costs. There is only one primary election for both parties instead of two separate votes, and the results are easier to count than ranked choice voting tallies. Each voter gets one vote, the same as every other voter. Under the blanket system, the top two vote-getters in the primary go on to face one another in the general election. They may even be from the same party, as happened for a number of 2016 general election races in California. That means there are only two candidates in the finals, ensuring that the person elected will be the majority winner. Maine would no longer have plurality governors. Experts have suggested that with ranked-choice voting, LePage would not have won in 2010. That is equally correct for the blanket primary. To make any realistic change that would have an appreciable effect, the Maine Constitution, which expressly mandates plurality elections, would have to be amended. The wisest course would be to assume there are several reasonable solutions, not only ranked-choice voting. By considering alternatives and then proposing a constitutional amendment to Maine voters, the state could cut today’s electoral confusion, consider all alternatives and avoid the inevitable court cases about one person, one vote. The first step in the open and democratic process is to vote “no” on Question 1 on the state ballot. Gordon L. Weil is a former Harpswell selectman and headed three state agencies under Gov. Joseph Brennan. 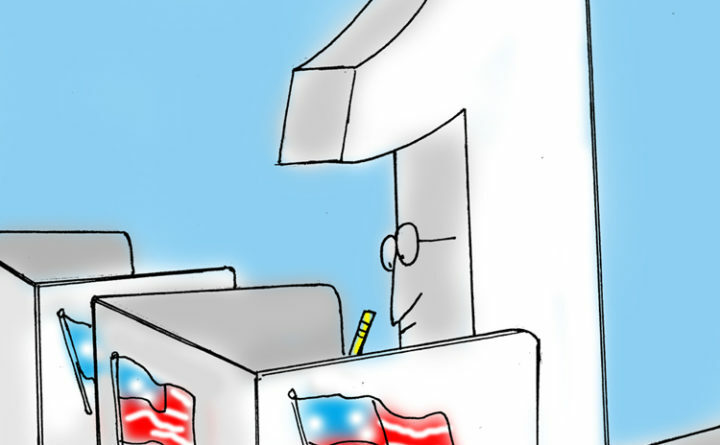 Weil writes the Notes from a Corner of the Country blog for the BDN.